In the busy commercial centre of Footscray at the intersection of Nicholson and Hopkins Streets in the pedestrian mall. There was a gentle mist rising around the rocks of Wominjeka Tarnuk Yooroom. 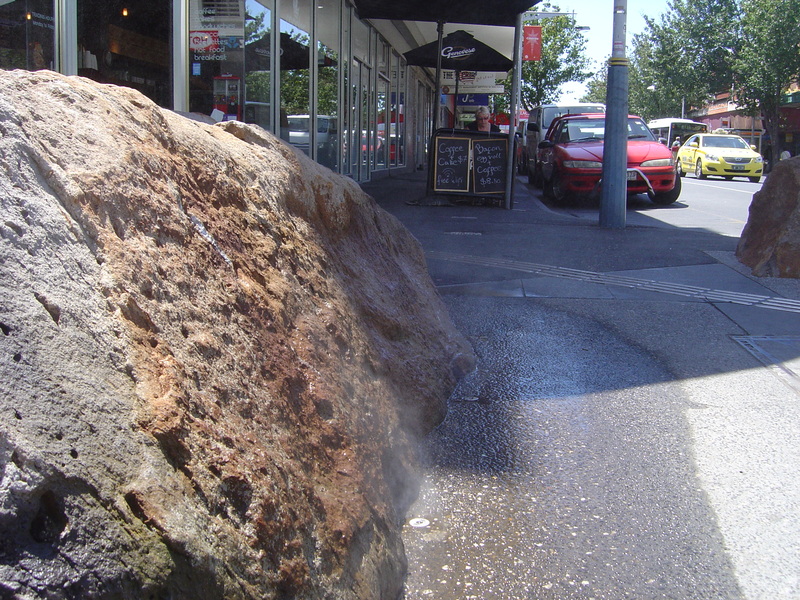 The fine spray of water at the base of the rocks is intended to represent the smoke in aboriginal ceremonies. 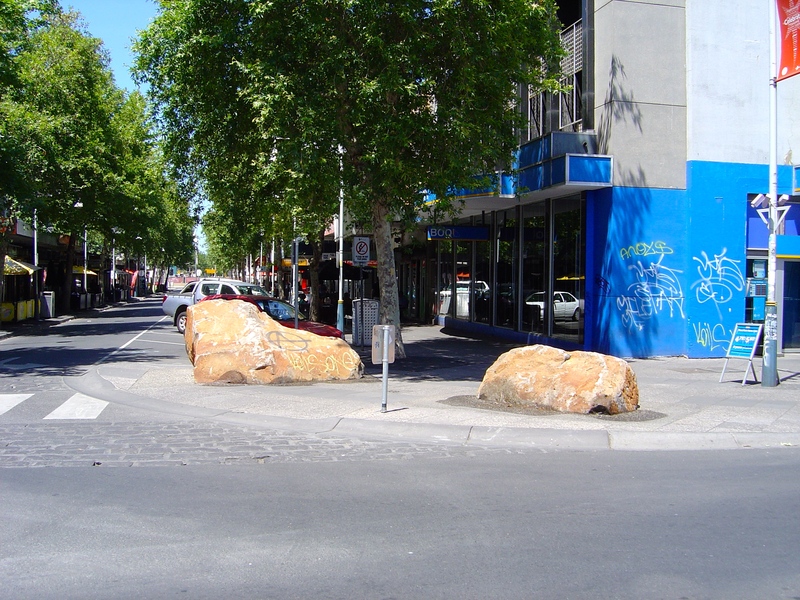 The series of rocks helps define the intersection, adds to the pedestrian area and the rocks connects the place to earth. The sculpture is very recent but people are taking to it; it was hard to get a photograph without someone’s child or dog getting in the way. 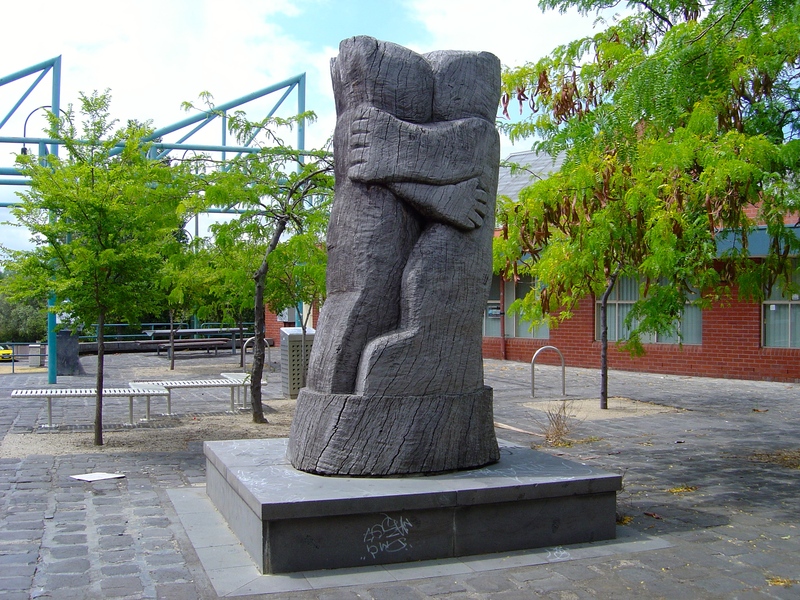 Looking for Bruce Armstrong sculpture, Two People Hugging I found myself in a well designed neighbourhood of mostly public housing. The traffic of busy Moore St was gone; the pavement changed to pavers rather than concrete and even the sound of my footsteps changed. There were several small squares (sunburnt from the recent heatwave – I hope the trees grow in) in the area and public seating. Two Persons Hugging located in a square midway down Vipont Street, a quiet street; you wouldn’t know that it was there unless you were a local. This square at the start of a series of stepped parks and playgrounds that lead down to the parklands along the Maribyrnong River. Two Persons Hugging is an early work by Armstrong; I haven’t been able to find an exact date. The monumental carved wood is solid and the two persons are inseparable and awesome. The wide plinth at the base of the sculpture adds to the seating options in the square. Bruce Armstrong was born in Melbourne in 1957 and after he graduated from RMIT in 1981 his sculptures are influenced by many mythologies creating archetypal beasts. Along with being represented in major art galleries and international collections Armstrong has public sculptures in several other Melbourne’s suburbs including Moonee Valley, Ascot Vale and Chadstone Shopping Centre. The position of both of these sculptures, in their different parts of the suburb makes them landmarks for that small area, defining the way that people see, move and talk about the place. These two sculptures might only get a small mention in my book amongst the other work their sculptors have done but I’m glad that I took the time to see them and how they work with their locations. The centre of Melbourne’s art scene will continue to move slowly counter clockwise around the centre of the city towards the western suburbs. It had already moved through St. Kilda and Prahran by the 1970s and was moving up to Fitzroy by the 1980s. Look out Footscray.